For me, creating a wedding registry has been a bit overwhelming. I’m having a hard time deciding what housewares I want for the rest of my life. And on top of that, I have to figure out how much of this stuff we actually need. According to Macy’s suggested wedding registry checklist, I should register for 12 place settings, 12 crystal stemware settings, silver flatware, stainless steel flatware, casual china, everyday china, bath towels, bath sheets, bed sheets…you get the idea. I don’t have enough cabinet space as it is and I can’t picture myself placing more than one glass in front of a guest at dinner party. After a lot of contemplation and web surfing, I decided to do what all the experts say you’ll regret: I didn’t register for china. I’ve got a few family sets headed my way and I think the alternative I chose is just as nice—and dishwasher safe. Keith and I both agreed on the Wickford pattern from Kate Spade. Officially classified as Casual China, the dishes are made from porcelain so they'll withstand the wash cycle and still impress my friends at dinner parties. 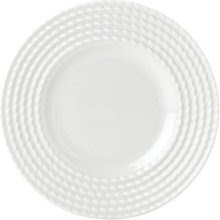 I thought white would be the most versatile and the basket weave pattern adds a little life to the dishes. So I didn’t splurge on fancy table settings, but I did go to town in the cookware department. I turned to my top chef cousin for advice and he told me to register for All-Clad. He also gave me some guidance selecting what I’d need: an 8-inch frying pan, a 10-inch frying pan, an 8 qt. stock pot, a 2 qt. 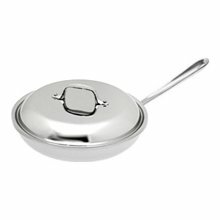 sauce pan and a 4 qt. sauce pan. “They’re expensive, but they’ll last for the rest of your life,” he said. I intend to be cooking risotto till I’m 90, so I scanned those pots in. Our registry adventure is only half way over. We’ve got one more to create (Amazon) and some price comparisons to make. At this rate, it’s looking bleak that I’ll have it done before shower invites go out. Brides, what’s on your registry? What am I missing? Tell me what kitchen gadgets you can’t live without? And any registry regrets of your own? Curious to see what else we registered for (so far)? Have a look at our Macy's registry. You'll have the rest of your life to be practical - register for some luxury items that you will never buy for yourself and will cherish breaking out at special occasions.. you'll be glad you did! Yes, they are expensive, but they are worth every penny. You can get them replaced (if broken) or sharpened (including serrated) for the rest of your life. I sound like a salesman... but they are worrrrrth it! Get someone to buy them for you! I had the same debate & broke down & registered for fine china from Kate Spade. Now I can't wait to break out our pretty place settings, even if it's simply for a party of two.